In our recent annual recap, we talked about what a huge year this has been for us. Not only did we embark on a number of short projects like workshops and summer camps, but we also successfully completed our 5th SnackDown contest. All-in-all it’s been a busy year for us, full of twists and turns but the ride isn’t over yet! Every year, during our birthday month, we try to bring our community one big launch or feature that you’ve all been craving, and we can proudly announce that the Birthday present you’re all getting this year is a brand spanking new discussion forum! Everyone say hello and welcome to the new CodeChef discussion forum. While our existing forum has served us well, we knew it was too slow to keep up with our growing community. So this year, we finally made the call to retire old faithful and move on to a newer and faster Discourse-based forum. Our new and improved forum will have a clean, new look and will boast a number of improvements. You’ll now get convenient single line conversations (with the option to expand replies), informative link previews, and a mobile-friendly format. CC Discourse will be a seamless extension of your CodeChef account which means you’ll have the same username. Over the years each of our team members, as well as our 1 million strong community, had thousands of conversations on discuss and we certainly couldn’t wipe all those stories away. All your treasured conversations will be imported to the new forum. So what are some of the changes you’ll find? Let’s start with a difficult one: unfortunately, we can no longer accommodate karma points. Our new forum does not support this feature, so we took the call to scrap it in favour of many other benefits. You’ll also notice that posts on the new forum cannot be upvoted or downvoted. However that doesn’t mean that you can’t show your appreciation for a great post, you can always use the like buttons. The new forum will also have Single Sign-On, which means that your CodeChef account will be used to sign you into the forum. You do not need to create a separate profile or account to use this forum. This is only limited to authentication. After getting user authentication from the CodeChef website, the session is independently maintained on the new forum. CodeChef was designed and created to help programmers acquire the tools to improve their own skills and abilities. Discussion and debate are a huge component of learning and our aim has always been to provide a platform that lets you do just that. Whether you’re in Russia or Rajasthan, China or Chile, you can always visit the CodeChef discussion to have your own doubts clarified, to post a solution, or to connect with other programmers on the platform. Now let’s take this discussion over to our new forum! As always, if you face any issues feel free to send a description of the problem you’re facing, to bugs@codechef.com. CodeChef has completed 10 years of being India’s most popular competitive programming platform, but we’re only getting bigger and better with time! 2018 was a huge year for us, we kicked things off with the launch of rating divisions in March of 2018. The new divisions allow for fair competition among our users, with Division 2 users now able to compete against each other for prizes and ranks in our contests for the first time. We also focused on promoting competitive programming among women through a dedicated Women’s Day campaign. Through March and April, our team lead Anup Kalbalia, was jetting from one college to another to spread the word about CodeChef and encourage participation in the ICPC. Several universities had the benefit of this orientation session and this year we hope to reach even more. At the end of the month, Anup also represented CodeChef at the ICPC where he spoke at the ICPC CLIS 2018 about competitive programming & sustainability. Anup was also invited to offer live commentary on ICPC’s global online channels. A proud moment for CodeChef! May was a jam-packed month for us! We held a special workshop for School Teachers at ABV-IIITM Gwalior, we felicitated the young Indian programmers who represented the nation at the prestigious IOI competition, we held our first ever open programming workshop in Hyderabad, as well as our summer school programming workshops. Through June and July, our workshops continued, with a special focus on teacher training. CodeChef offers a series of workshops for different groups, including DSA training for college students and professionals, pedagogy training for teachers and professors and Python training for school teachers in Pune in collaboration with CSPathshala. 2018 saw us administer every kind of workshop in our repertoire with tremendous success. In August, we had a trio of achievements to our credit. Our Alibaba Hackathon represented not only our very first partnership with a major international company but also our very first Hackathon as well as the public launch of our API. This was a huge feat for us, and we were heartened by the community’s amazing response to our API. You can check out some of the interesting app ideas that we received from you all here. September saw the launch of SnackDown 2019 registrations which kept the team busy. There was no slowing down in the last quarter as this period saw the launch of online qualifying rounds for both SnackDown and ICPC 2019. We powered through three rounds of elimination for SnackDown and finally by December, we had our top teams. December also found our team traveling to all ends of the country for the much anticipated ICPC Regionals in Kharagpur, Kolkata, Kanpur, Gwalior, Pune, Amritapuri and Coimbatore. Meeting competitive programmers from every corner of the country was an exciting and exhilarating moment for us. Our T-shirts had a new and rather bold statement, and they were once again a huge hit with the participants. In January, there wasn’t a moment to breathe as SnackDown preparations were in full swing by the new year. But our Schools team found a couple of days to dedicate to ICO related activities. CodeChef is the community and platform partner of IARCS for the ICO, as part of this partnership we not only conducted the ZCO and INOI exams, we also conducted our first ever completely volunteer-driven INOI workshops in 10 cities. These workshops were created to introduce school students to some of the more advanced topics that were essential to compete at the INOI. Not only did our attendees love them, our intern Abhishek enjoyed teaching them too! Now on our 10th birthday, we’re going right back to the beginning of the roller-coaster for another year full of coding excitement and magic as we embark on ever more new projects, and work together to deliver more experiences to our growing community. We have 38 teams participating this year from across the globe for Snackdown’s Onsite Finals. I’ll be giving live updates here. If you have any questions related to the contest, please ask them in the comments. 10:30am — Contest has begun. 10:39am — [user:LHiC,2019-02-16] from team login228 gets the first accepted submission of the contest. Several other teams have submitted a solution for the same problem within the next minute. 10:52am — login228 solve their second problem of the contest and lead the ranklist. 10:55am — 24 teams have solved at least one problem. 11:00am — Team End Time ([user:dotorya,2019-02-16] and [user:zigui,2019-02-16]) solve their 2nd problem and lead the ranklist. 11:10am — 9 teams have solved 2 problems so far. Team pastry ([user:tourist,2019-02-16] and [user:qwerty787788,2019-02-16]) are currently at rank 3. 11:15am — We now have 4 distinct problems solved in the contest. 11:22am — All school teams have solved 1 problem so far. Antipr00 (Adhyyan1252 and rajarshi_basu) lead on the basis of time penalty. 11:27am — pastry solve their 3rd problem (XYPRESQ) and lead the ranklist. havkapapstvo solve their 3rd as well. They are now at rank 2 with a time penalty difference of 7 minutes. 12:00pm — login228 solve their 5th problem — pastry is no more at rank 1.
umnik_team (Um_nik and Merkurev) have solved 5 problems and are now at rank 2. pastry is no more at rank 2. 12:15pm — Pastry solve RAFFLE and they’re back at rank 1. 12:41pm — login228 solve ORDNCHS. 12:42pm — Pastry solve CIRCBIN. They are only 2 minutes ahead of login228 in time penalty. 12:49pm — login228 and pastry have made submissions within a gap of 12 seconds of each other. 1:30pm: contribution (Radewoosh and Swistakk) solve KSUFFIX. 1:31pm: contribution solve CIRCBIN within 1 minute of their previous AC submission! 1:42pm: osass (jiry_2 and wxhtxdy) solve their 8th problem — CIRCBIN and move to the top of the ranklist! pastry follow them at rank 2 and umnik_team at rank 3 with 7 problems each. 2:20pm: pastry solve their 8th problem and move back to rank 1. 2:30pm: Scoreboard is now frozen. The top 3 teams have solved 8 problems each. Only 1 team has solved STRSUM and no team has solved RIVERLND. Stay tuned to know the final results! Our SnackDown 2019 champions are Gennady Korotkevich and Borys Minaiev of team Pastry! In second place were Oleg Merkurev and Aleksei Daniliuk of team Dandelion. Yuhao Du and Ruyi Ji of team osass took the third spot. Shih-Yu Wang and Zi Song Yeoh of team zscoder<(_ _)> who were the top school team while Xiaoou Zhou and Jiayi Mao of team team03060724 were the top women’s team. Today we’re in conversation with Abhishek Pandey, known in the CodeChef community as vijju123, about his experience as a volunteer at one of our INOI Workshops in Mumbai that was conducted on the 12th and 13th of January. For those who don’t know him, Abhishek is an active competitive programmer with a max rating of 6 stars on CodeChef, who caught our eye by being an active and helpful contributor to our discussion forum. We reached out requesting him to be one of our discussion forum moderators and he readily agreed. Abhishek also has been a tester, editorialist (a favorite with the CodeChef community) and is the admin of the external rated contests hosted on CodeChef. Abhishek’s dedication to the community and his hard work earned him an internship with CodeChef’s Contest team. 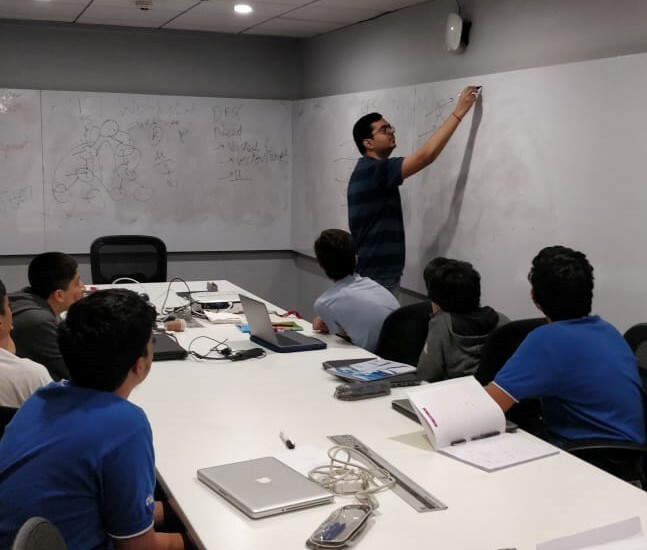 As a part of his internship, he visited our Mumbai office for a week and we roped him in for this workshop, without getting much of his consent Fortunately he enjoyed himself and our students loved interacting with him. Well, that was a lot from us, now let’s hear from Abhishek about his experience. Did you enjoy teaching this workshop? I always wanted to try my hand at teaching. I kind of developed a liking for it while tutoring my younger brothers and cousins :p. But that’s an altogether different story. Why the workshop was a nice experience in the first place? Because of the kids . When someone comes with a will to learn, even the teacher’s wish to teach gets rekindled. It’s a lot of fun to teach someone who is curious about the subject. What are your feelings towards the workshop? Two words – Positivity, and Responsibility. The workshop overall is a positive experience, and no doubt such ventures should be encouraged – even at the college level. Responsibility – because you have to make sure the kids don’t go home disappointed! That’s why I tried my best- even if it meant preparing/revising lecture plan at 4 am in the morning after finishing work. I was happy to know that the workshop was up to my mentor’s standards when she assigned the role to me. If you are relying too much on someone else to solve your doubts, you won’t know how to solve them yourself! Most people don’t understand tutorials because they are intimidated by the unknown. Don’t follow the herd, lead it instead. Find DP (Dynamic Programming) tough? Well, you should be looking for a challenge and not shying away from it! Time management is a skill that’s going to help you throughout life. We’ve had a gruelling ICPC season so far and here we are today to give you live updates from the last Indian ICPC regional of the year being held at Amrita University. This is the largest regional in Asia with over 270 teams participating across 2 sites – Coimbatore and Amritapuri. We are expecting the contest to begin in 5 minutes. Every regional this year has had nail-biting finishes. Today’s contest is expected to be even more intense with a lot of top teams competing against each other. UniverseIsDeterministic (CMI) with Rajat De in their team and GeometryIsLove (IITM) with Teja Vardhan Reddy in their team who were rank 1 and rank 2 respectively at the Kgp regional, are participating in today’s contest. Far_Behind (IITD) who solved 3 problems in the last 1 hour at the Kgp regional to end up at rank 3 will also be participating today. tesla_protocol (IIIT Hyderabad) led the ranklist for a long, long time in the Gwalior regional but ended up at rank 3 after a magnificent performance by BhayanakMaut and ButterRoti. They will be targeting a podium finish today as well. Hold right there Sparky!! (IIT Roorkee) won the Kolkata regional with a great performance in the last 1 hour. Will they take it easy today as they already have a potential WF slot in hand or fight it out? Other teams like Microwave-O(1), proofByAC and MexFlow, to name a few, have done well in previous regionals but haven’t made it to the top 3-4 ranks. They will be itching to get that WF slot today. 9:47 am: Kimi no Na wa (IIT Roorkee) score the first AC, 2 mins 19 seconds into the contest. 9:52 am: 7 minutes into the contest, 121 teams have solved 1 problem. 9:54 am: bits please solve CNTFAIL – first team to solve 2 problems, now at Rank 1. Yes they are! tesla_protocol move to rank 2 and MexFlow move to rank 3 respectively with a time difference of 23 seconds. tesla_protocol has a time penalty gap of 40 seconds with bits please who are at Rank 1 currently. 10:00 am: UniverseIsDeterministic gets a WA on ARMYFGT. Most teams are using Python to solve ARMYFGT. 10:07 am: tesla_protocol solve CNTFAIL and lead the ranklist with 3 problems solved. 10:28 am: 37 teams have solved 3 problems so far. tesla_protocol leads the pack, proofByAC is at Rank 2 and Laila (IIT Roorkee) is at Rank 3. 10:31 am: Team “ForgotToWarmup” just got WA on a problem called “SAUNA”. “Apt team name”, says Balajiganapathi from the judging panel. 10:36 am: UniverseIsDeterministic are the first team to solve PALPATH. They are now at Rank 1 and we have 4 problems solved in total. GeometryIsLove submit AVLBLT aaaaand it’s correct! They immediately replace UniverseIsDeterministic at the top of the leaderboard. 10:38 am: dilliMetro solve MARTING1, their 4th problem. They replace GeometryIsLove at Rank1. The last 3 minutes have been quite exciting. 10:42 am: Laila (IITR) solve their 4th problem with 0 penalties and now lead the pack. 10:52 am: Hold right there Sparky!! from IITR solve their 4th problem and are the first to solve ALFRED, the 7th problem of the contest. They are now at Rank 3. 10:58 am: UniverseIsDeterministic solve ALFRED. They have now solved 5 problems and are back at Rank 1. 11:01 am: GeometryIsLove solve SAUNA. They have now solved 5 problems are at Rank 2. 8 distinct problems solved. 11:04 am: DeathNote from IITB solve ALIENINV. A very interesting, mathy problem. 9 distinct problems solved. 11:13 am: Math_maniac solve BALSUB. 10 distinct problems have been solved in the contest. 11:19 am: tesla_protocol solve MARTING1 and take away the lead from UniverseIsDeterministic. 11:21 am: Hold right there Sparky!! solve MARTING1 and are now at Rank 1. This is turning out to be a very competitive contest. It seems to be quite non-trivial to predict who the winner will be. 11:44 am: GeometryIsLove get TLE on PALPATH. 12.54 pm: Laila has seized the lead by solving their 8th problem! 12.55 pm: bits please has also solved their 8th problem pushing UniverseIsDeterministic to third place. UniverseIsDeterministic has got 2 WAs on REFORMS, but can they make a comeback? 1.16 pm: Team UniverseIsDeterministic has solved SAUNA and jumped back to rank 1! Team bits please from IIT Kanpur secured the first rank while Hold right there Sparky!! and Laila – both from IIT Roorkee – landed the 2nd and 3rd spot respectively. Congratulations to the winning teams! Our 66th Lunchtime took place on November 24 and it was a showdown to remember with a major rank list shake-up! Keep reading to read who gained ratings and who lost them in the November Lunchtime. Leading the pack in Div 1 was uwi, who is presently ranked number 1 in Japan and number 5 globally. Following our 100th Cook-Off, we mentioned in our Contest Recap that uwi was less than a hundred rating points short of a spot in the global top 5. Looks like, uwi took up the challenge and dethroned China’s ACRush to claim the world number 5 spot. But ACRush is a regular in our Long Challenges, stay tuned to see if he makes a comeback next month. Other notable mentions in Div 1 are zemen from Russia who moved to 5-star status in this competition and rns5 from North Korea who went from 5 stars to 6. natsugiri, also from Japan, rounded out the top 4, all of whom scored 500. rns5 has risen rapidly through the rating system, gaining a whopping 6 stars since joining CodeChef in August this year. He needs just about 182 rating points to join another, rns4 another celebrated Kim Il-sung University student, in the 7-star club. In Div 2 mzuev from Russia, took the lead going from 2 to 3 stars in the process. Close behind was xuzijian629 from Japan who was participating in a CodeChef contest for the very first time and made a rating jump of 275 points, which is the maximum jump possible! He promises to be a coder to watch out for. Dubai based antrikshh claimed the third spot, with Indonesia’s sidiqha in 4th place. While no Indians made it to the top 10 in Div 1, 4 Indians secured spots in Div 2’s top 10. A huge shoutout to its_ulure, mindjolt, radon12 and shubham698. School students were well-represented in the November Lunchtime Div 1 with 9 of them earning places in the top 20. The best performers were tmwilliamlin from Taiwan who was at rank 5, farhod_farmon from Tajikistan at rank 7, and Ukraine’s adalbert at rank 8. Div 2’s best performing school students were its_ulure from India at rank 5, arafat_01 from Kazakhstan at rank 9, and fake_here from China at rank 15. Special mentions go to female coders amina283 from Azerbaijan and mh755628 from Bangladesh, both of whom made it to the Div 1 top 100. In Div 2, it was hui_yin from Hong Kong and India’s own viralivora who reached the top 100. Joining xuzijian629 on the list of users who made sizeable rating jumps are mzuev from Russia and tyakennikku from China who improved their rating by 233 points each. Indonesian sidiqha enjoyed a rating jump of 209 points while India’s own its_ulure from West Bengal, increased his rating by 201 points. The highest participation this month came from India, followed by Bangladesh and Ukraine. India’s National Institute of Technology, Kurukshetra and Jaypee Institute of Information Technology had the most participants in this Lunchtime. If you’d like to spread the word about competitive programming in your school or college, start by creating or joining a CodeChef Campus Chapter today. Probability (PPAP) emerged as the least solved problem of both Divisions with no successful submissions in Div 2 and just 7 in Div 1. Event (EVENT) was the most solved problem of Div 2 with 769 successful submissions out of a total of 5738 while in Div 1, Beats and Pieces (BPS) got 169 successful submissions from a total of 576. Check out the editorials for this Lunchtime’s problems here. And as always, many thanks to our problem panel admin Hasan Jaddouh (kingofnumbers) whose hard work helped us pull the contest together. The November Cook-Off may be behind us, but the excitement still hasn’t left our system! This was CodeChef’s landmark 100th Cook-Off and we rewarded not only our top performers but also a bunch of participants, selected randomly, to show our gratitude. Keep reading to know what went down during this historic Cook-Off. Also in Div 1, artistmusicant and ll931110 who were at ranks 3 and 4 respectively, both graduated to 5 stars during this Cook-Off. artistmusicant was notably the only female programmer in the top 10 during this Cook-Off so hope she inspires all the girl-coders out there! grikukan from Russia stirred things up in Div 2 where he earned the first rank. This University student is teetering on the brink of Div 1 with a rating of 1786, but he’s had a tumultuous journey through CodeChef’s contests slipping from 6 stars to 3 stars last year, and nobody knows better than us that anything can happen in a CodeChef contest! petergendy4 from the US swooped into second place with a score of 2, and in the process went from 3 stars to 4. Among school-level coders, sanroylozan from Hungary, evpipis from Greece and adhyyan1252 from India were a cut above the rest. These school students are all 6-star coders, we hope they can all graduate to 7 stars soon and give the more experienced coders some competition. There were no seismic shifts in this month’s Div 1 and Div 2 order, but 61 users from Div 2 graduated to Div 1 while over double that number (137) fell back to Div 2 from Div 1. Just a reminder that in the word of competitive programming, you can’t get too comfortable with your rating! You have to keep practising and competing to stay on top. As far as participation goes, India had the most participants with over 2000 coders taking part in the Cook-Off. The United States and Bangladesh were tied in second place with 23 participants each while 9 Cook-Off coders were from Russia. The problem Truth and Dare, emerged as the most solved problem with 1781 successful submissions out of a total of 4355 while Data Pipelines was the least solved with 0 successful submissions in Div 2. In Div 1 Elephants in a Pond got just 1 successful submission. You can check out editorials for all the Cook-Off problems here. And an extra special thanks to our problem panel admin Hasan Jaddouh (kingofnumbers) who went above and beyond to make our 100th Cook Off memorable for everyone! The November Long Challenge was an exciting one and we’re reliving all the contest chaos through our official November Challenge Recap. Our standout coders this month were ACRush (Div 1) and xhm154 (Div 2), both from China who aced the Long Challenge with scores of 800 each. In the Division 2 category, a notable mention goes to browni3141 from the US who made an ambitious leap from 1 star to 3 stars by securing the 2nd spot with a score of 799.199. Div 2’s 3-star coders zhouzhendong and zhouyuyang had snagged early leads, but while they were ousted from the top spots, they each earned a star and moved to the 4-star club. Interestingly, all of the top 10 participants in Div 2 earned at least a star in this contest, so Div 1 regulars had better watch their backs! Meanwhile, in Division 1, most of the key players in the top 10 retained their existing status with some notable exceptions. samjia2000 from China and wmoise from the USA, both earned the elusive ticket into the red 7-star club. wmoise is now ranked 8th in the USA and 83rd worldwide, while samjia2000 has a country rank of 16 and a global rank of 75. But as we all know, the contests giveth and the contests taketh away! We hope the new entrants are prepared to fight for their spots! We also had North Korean rns5, the lone coder with the purple band, who battled 6 and 7-star competitors to add that coveted 5th star to his band with a score of 799.686. Shoutout to our top ranking school students whzzt, peehs_moorhsum and samjia2000 who all secured spots in the Div 1 top 10 with scores of 780 and above. In Div 2, 4 of the top 10 ranked coders were students: xhm154, howarli, zhouzhendong and zhouyuyang. These rising stars will soon be keeping experienced coders on their toes! Our homegrown coders also found themselves in the top 10 in both Div 1 and 2 categories. yash_chandnani from Jaipur retained his 7 stars and secured the 5th spot in the Div 1 rank list with a score of 799.513. In Div 2, halberdier secured the third place while thefear from Uttarakhand and Kolkata’s rv_619 landed the number 9 and 10 spots respectively. A whopping 7421 coders increased their ratings in the November Challenge, and 301 Div 2 coders graduated to Div 1 with ab_initio from the USA who made a significant 186 point rating jump while India’s very own coder3101 from Jharkhand earned 176 rating points during the Long Challenge. Female programmers from India made their presence in the competition felt with 4 coders making rating jumps of over 200. Mumbai’s ziggywiggy led the pack with a rating increase of 217. Among school students, cunbidun from Vietnam increased his rating by 233 points while ilionoid from Kolkata, India saw a rating increase of 219. The Div 1 pool just got a lot bigger since 307 coders graduated from Div 2 to Div 1 following the contest. Salute to eriktillema from the Netherlands who earned 228 to make this leap. As for the problems, “Chef and Difficult Contests” ironically emerged as the most solved problem with 9774 successful submissions while Max Digit Tree and Chef and Equations saw just 17 successful submissions each. You can check out editorials for all the Long Challenge problems here. And an extra special thanks to our problem panel admin, Misha Chorniy (mgch) whose efforts in the Chef’s Kitchen make our monthly contests fun for everyone!